Those who know me well know that I firmly believe that context is everything. This comes partially from my educational background (political science and history), but also just from common sense: if you don’t correctly understand the history, setting, culture of whatever it is you are discussing/researching, your findings will not be wholly accurate. This is especially important when it comes to the Bible and the teachings of Jesus: if you don’t understand the cultural context, many of the passages won’t make sense at all to our modern minds. 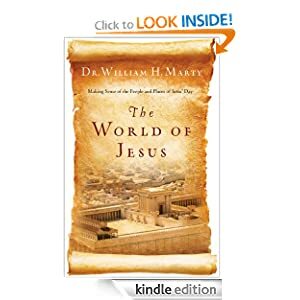 This book, The World of Jesus: Making Sense of the People and Places of Jesus’ Day, seeks to make the history interesting and concise in an effort to bring history to the reader in easy to read language. Even though I studied this history at length in college, I still learned new things from this book and I really enjoyed it. The author’s writing style is compelling and he makes the stories flow together so well! I really appreciated how he merged the history that we glean from the Bible with the other historical sources of those times (i.e. Greek, Jewish, etc.) to create a full picture of what was happening around the world, all in one place. It helped make sense of so many cultural traditions of Jesus’ day! Whether you love or hate history, I think this book is an important one to pick up. It will help you develop a much more enlightened context for the New Testament (and the Old, for that matter) and will leave you wanting to know more.